Brush cleaning day is basically my worst nightmare. Yes I love having clean brushes but holy crap it takes a lot of effort that could be better spent doing something more interesting like baking brownies or trying to find green juice recipes that don't resemble pond water. 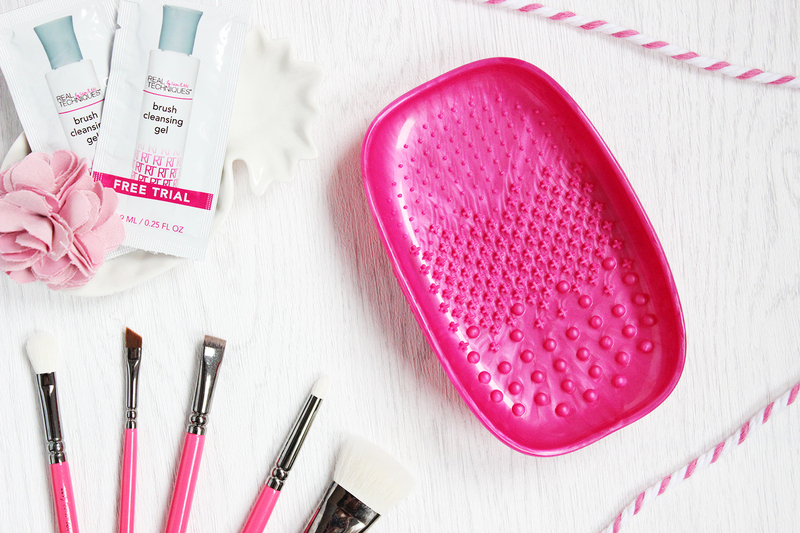 The Real Techniques Brush Cleansing Palette is the new kid on the block and I'm going to tell you right now, just do yourself a favour and go buy one. Right this second (well, after you finish reading this review). A. It's pink. B. It's affordable and C. It makes cleaning brushes so ridiculously quick! No more washing foundation brushes several times to make sure they're clean - they're done in seconds and with minimal effort. Boom. To use it, wet your brush, apply a small amount of your chosen brush shampoo (you can use the matching Real Techniques brush cleansing gel to great effect) and then rub your brush across the knobbly bits for a few seconds. The smallest ones work great on eye and lip brushes, with the larger sizes being best for bigger brushes, but there's no reason you can't just rub it across the entire pad quickly. Be amazed at how much gunk comes out of your brush, rinse well and leave to dry. It's so much quicker than doing it all by hand and for anyone with a lot of brushes to wash I honestly can't recommend it enough. I haven't noticed any issues with bristles splaying after use or changing in brush shape and it seems fine to use with natural fibre and synthetic brushes. All they need to do now is create some sort of brush drying machine and brush washing day suddenly becomes 'brush washing 5 minutes'.